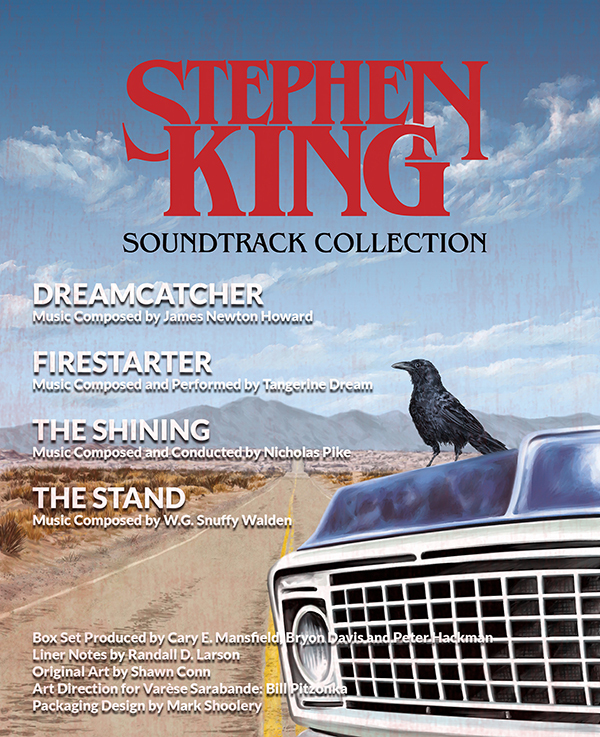 Varèse Sarabande Records is proud to announce a new 8-CD box set celebrating the music of four classic Stephen King titles – DREAMCATCHER, FIRESTARTER, THE STAND and THE SHINING. The limited edition STEPHEN KING SOUNDTRACK COLLECTION box set (1500 units) is designed to pay tribute to Stephen King paperbacks with a 24-page bound booklet. Two beloved titles are featuring expanded editions. The 1994 post-apocalyptic mini-series THE STAND, earned prolific composer W. G. Snuffy Walden an EMMY® nomination that year. The four-part mini-series boasted an all-star cast including Gary Sinise, Rob Lowe, Molly Ringwald, Ray Walston, Ruby Dee, and Ossie Davis. Directed by Lawrence Kasdan, 2003’s DREAMCATCHER features original music by Academy Award® nominee James Newton Howard. Both are being released as 2-CD deluxe editions. One of the earlier Stephen King books to be adapted into film, FIRESTARTER features original music by Tangerine Dream – and is being reissued for the first time in almost 15 years. The film launched Drew Barrymore into superstardom, following her introduction as Gertie in E.T. two years earlier. The album is considered the crowning achievement from one of the band's most prolific lineups (Edgar Froese, Christopher Franke, and Johannes Schmoelling). The 1997 three-part mini-series THE SHINING is being presented on a 3-CD set, one disc for each night of the special event series. The origin of the miniseries is attributed to King’s dissatisfaction with the 1980 adaptation directed by Stanley Kubrick. The mini-series was shot at The Stanley Hotel (Estes Park, CO) – which was the hotel that inspired King to write the book in the first place. The Nicholas Pike-penned score is being released commercially for the first time. Housing the collection is a 24-page bound booklet, featuring liner notes by Randall D. Larson with original art by Shawn Conn.
STEPHEN KING SOUNDTRACK COLLECTION will be available directly from Varèse Sarabande Records www.varesesarabande.com on November 10, 2017. Wellgo USA Entertainment: "THE VILLAINESS"
"Howlin' Wolf Records" New Releases! Broad Green Pictures: "THE GOOD CATHOLIC"
Lionsgate Home Entertainment: "THE GLASS CASTLE"
RLJ Entertainment: "THE LIMEHOUSE GOLEM"
Milan Records: "The Killing Of A Sacred Deer"
SILVA SCREEN RECORDS: "BLUE PLANET II"